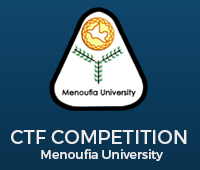 For the first time in Egypt, We are conducting Cybersecurity CTF Competition at Menoufia University where you can participate as a Team and compete in your field of interest. Here we will be testing your cyber security skills, the competition will start on the 20th of October 2018 at Menoufia University. The first winning team of Menoufia University Cybersecurity CTF Competition will participate to represent Ain Shams University at Egyptian Universities Cybersecurity CTF Competition 2018 that will be held in December 2018 .